Kirstenbosch National Botanical Garden is hailed as the most beautiful garden in Africa and is acclaimed as one of the great botanical gardens of the world. The garden forms part of a UNESCO World Heritage Site, and is one of Cape Town’s most popular tourist attractions. 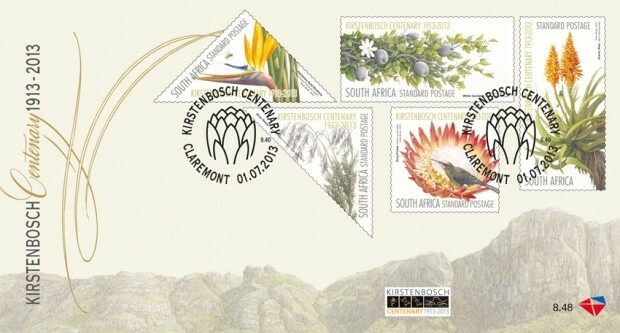 This year, Kirstenbosch celebrates 100 years of promoting, conserving and displaying the unique indigenous flora of South Africa. 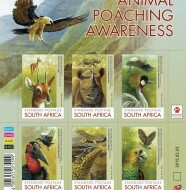 To mark the centenary of what has been called “Africa’s most beautiful garden”, the South African Post Office will issue a set of 10 stamps with two commemorative covers on 1 June featuring some of the most popular species found in the garden. of southern Africa, and was the first botanical garden in the world to be devoted to a country’s indigenous flora. Kirstenbosch displays a wide variety of the unique plant life of the Cape flora, also known as fynbos, as well as plants from all the other regions of southern Africa. Those that cannot survive outdoors, such as plants from the arid regions, are grown in the Botanical Society Conservatory. There are more than 7 000 species in cultivation at Kirstenbosch, including many rare and threatened species. But Kirstenbosch is more than just a garden; the 36-hectare estate is part of a 528-hectare nature reserve that contains protected mountainside supporting natural forest and fynbos, along with a variety of animals and birds. The Kirstenbosch Estate borders the Table Mountain National Park. Kirstenbosch lies in the heart of the Cape Floristic Region, also known as the Cape Floral Kingdom. 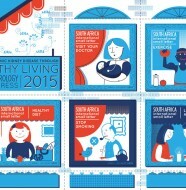 In 2004, the Cape Floristic Region, including Kirstenbosch, was declared a UNESCO World Heritage Site. 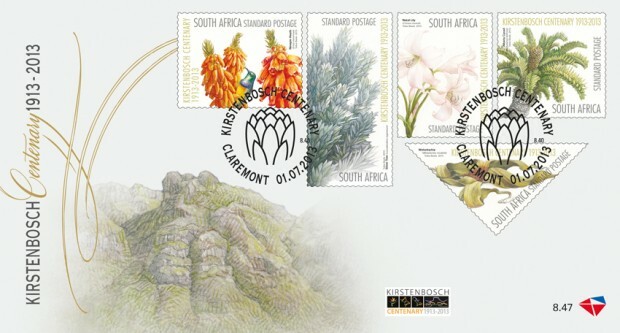 Alice Notten from the South African National Botanical Institute (SANBI) at Kirstenbosch, helped to compile the list of species depicted on the stamps. Setempe asked her how they went about choosing among such a wealth of species: “We chose plants that have been associated with Kirstenbosch since the beginning and that have a connection to the garden’s history or people in its history, and those that visitors will see growing in Kirstenbosch. “We short-listed plants that were introduced to Kirstenbosch in 1913. First choice was given to those plants where the original 1913 plant was still alive – i.e. 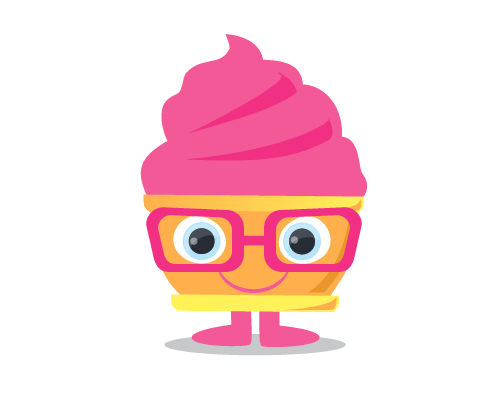 one of our centenarians. But we also wanted to represent as wide a range of plants as possible, such as a cycad, a protea, a bulb, a succulent, a restio, an erica, a tree, a shrub. We therefore broadened our definition of a Kirstenbosch centenarian to include offspring by seed, cuttings or division of the original plants, even though the plants themselves are younger than 100 years old; so the same genetic type has been kept alive by propagation these past 100 years (this applies to bulbous plants, herbaceous plants and the shorter lived trees and shrubs). “However, in the few categories where there was not a centenarian, we either chose a species that had been introduced in 1913, but later died out, although we had more recent introductions of the same species, or we chose the earliest introduction in that category. 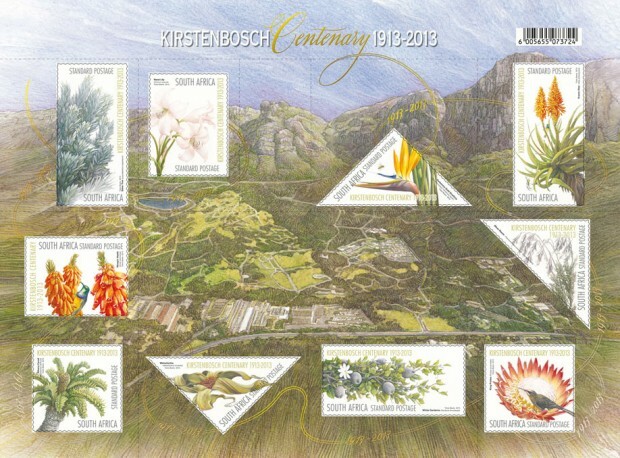 The only one that does not fit any of these categories is the centenary gold strelitzia, which we chose because it is a new Kirstenbosch special selection and will be released in 2013 as part of our centenary celebrations. 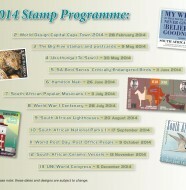 Cape Town illustrator and artist Tobie Beele, created the artwork for the stamps. Erica mammosa, Ninepin Heath was introduced in 1913. Although the original plants died, it was re-introduced many times and is one of the showiest heaths on display in the Erica Garden – it flowers in late summer and attracts many sunbirds. Encephalartos latifrons, Albany cycad. The original 1913 plants are still alive and well and growing in the Cycad Amphitheatre at Kirstenbosch in the same spot where it was planted back then. The first Director, Harold Pearson, studied cycads and other gymnosperms and was an authority on them. The living collection of cycads at Kirstenbosch is based on his collections. Thamnochortus cinereus, Silver Restio is a much more recent inhabitant of Kirstenbosch. Introduced in 1978, it has proved to be one of our most beautiful, adaptable and sought-after plants in the garden. Leucadendron argenteum, silver tree is indigenous to Kirstenbosch. The trees themselves are relatively short lived, but the species has always grown at Kirstenbosch. Aloe arborescens, Krantz Aloe was the first species introduced to Kirstenbosch in 1913. There are many different forms of this species growing at Kirstenbosch, and they flower profusely from autumn through winter (May to July/August). Gardenia thunbergia, white gardenia (or wild gardenia or forest gardenia) was introduced to Kirstenbosch in 1913 by the first Curator, J W Mathews. The original plant is still alive and growing where it was planted all those years ago. There are also many younger offspring of the original shrub planted in a few locations in the garden. Strelitiza juncea Centenary gold strelitzia, is a very special yellow-flowered cultivar of the usually orange-flowered rush-leaf Strelitzia (Strelitzia juncea). This species has no leaf blades, so the leaves look like pointed sticks, and the flowers are very similar to the regular Strelitzia (Strelitzia reginae), also known as the Crane Flower or Bird of Paradise. The Centenary Gold Strelitzia will be released for the first time in 2013, during the garden’s centenary celebrations. Welwitschia mirabilis. The first Director brought Welwitschia seeds to Kirstenbosch in 1913 and although those original plants did not survive, the horticulturists have been growing these desert plants, with difficulty in the much wetter climate of Cape Town, since the beginning. Up until the late 1990s when the Botanical Society Conservatory was built, these plants were kept in custom-built glasshouses in the nursery, and were not open to the public. Welwitshias are now growing in the Namib bed of the main house. One of the corner units of the conservatory has recently been converted into the Welwitschia House and it will be open to the public from July 2013. Protea cynaroides, King Protea was introduced to Kirstenbosch in 1914. Although the original plants have not been kept alive, this species has been growing at Kirstenbosch since the beginning. It is also indigenous to the natural areas on the Kirstenbosch Estate on the mountain slopes above the garden and is one of its most recognisable and sought-after plants in the garden.